Fancy taking photos on the fly and then uploading them to your preferred list of social networks? Good thing, then, that Kodak has your best interests at heart. Announced at this year's CES extravaganza, the company's showing off two of its newest connected imaging devices -- the Kodak Playfull Dual Camera and Easyshare M750. The compact Playfull has a 12MP camera capable of full HD 1080p video capture at 60fps, with an accompanying Xenon flash and a port for an external mic. But those specs aren't the camera's real draw -- that'd be it's built-in WiFi ability. Using the Share Button, users can instantly upload photos and video to YouTube, Kodak's own Gallery, as well as Facebook. The company's more traditional looking point-and-shoot refresh, the Easyshare M750, touts a 16MP module, 3-inch capacitive touchscreen, a RETINAR HD 5x zoom lens and a similar capability to share content wirelessly via an available network or through an installable app on iOS, Android and BlackBerry. When it launches later this spring it'll retail for around $170 and come in a smattering of colors, like silver, teal blue and red. As for the Playfull, well, nothing's quite been announced on it yet, but that could all very well change this week. Check out the official pressers after the break. At the 2012 Consumer Electronics Show, Kodak (#31400, South Hall) is showcasing a host of connected products and solutions that make it easy to create, share and print brilliant images wherever, whenever and however you like. 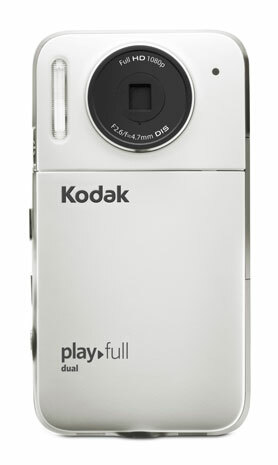 Kodak's new Wi-Fi enabled camera – the KODAK EASYSHARE Wireless Camera M750 – lets you share pictures instantly. Use the KODAK EASYSHARE Camera App with your ANDROID, APPLE or BLACKBERRY device1 to send pictures wirelessly to FACEBOOK, KODAK Gallery, and email– even email pictures to your KODAK All-in-One Printer. The camera also works with your home Wi-Fi network. The new KODAK PLAYFULL Dual Camera combines a 1080p/60 fps HD video camera with a 12 MP BSI CMOS digital camera for one powerful device. It has an external microphone jack, built-in Xenon flash, and Share Button for easy upload to FACEBOOK, YOUTUBE, KODAK Gallery, email and more. "Kodak has been synonymous with imaging for more than 120 years. And for today's social and mobile consumers, we continue to innovate to deliver intelligent and intuitive products that produce brilliant Kodak-quality images," said Vince Ferraro, Kodak's new global Vice President of Corporate Marketing and Consumer Digital Imaging Group. "People trust Kodak with their memories, and we want to help them do more with those memories. Whether at home, on the go, or at retail, Kodak has a smart and simple solution to capture, create, share and print." Ready to free your FACEBOOK photos? Kodak has two new printing apps that let you bring your FACEBOOK pictures to life. The My KODAK MOMENTS App allows you to effortlessly create a premium photo book from your and your friends' FACEBOOK albums and have it delivered to your doorstep. The KODAK Photo Collage Print App, the first photo collage home printing app on FACEBOOK, lets you easily create a photo collage you can conveniently print at home. Easily upload your FACEBOOK photos to your KODAK Gallery account to create a variety of photo products including prints, photo books and wall décor. Captured a great moment on video and want to commemorate it with a picture? Upload the video to your computer and use your KODAK All-in-One Printer to make a print2. With Kodak products, it's easy to share and print brilliant photos and documents, wherever you are. Use your EASYSHARE Wireless Camera with your smartphone to email pictures to any KODAK All-in-One Printer3 and KODAK PULSE Digital Frame, or send to your favorite social networking site. Print photos and documents from your smartphone, laptop or tablet, from anywhere in the world, with Kodak's new HERO All-in-One Printers that are Google Cloud Print ReadyTM and KODAK Email Print Ready4. Only Kodak offers the ultimate combination of smart features, high quality output and affordable ink. With the KODAK Pic Flick App, wirelessly send photos to your printer or PULSE Frame from an iPhone, iPad, iPod touch, ANDROID or BLACKBERRY device5. Send documents from your ANDROID device directly to your KODAK All-in-One Printer using Google Cloud Print with the KODAK Document Print App6. Start a Group Album on your iPhone with the KODAK Gallery Mobile App and invite your friends to add pictures to create a brilliant-quality photo book. With FACEBOOK Connect on KODAK Picture Kiosks, you can access your FACEBOOK photos to create and print brilliant keepsakes including photo books and personal greeting cards.Over one million customers have printed their FACEBOOK photos from a KODAK Picture Kiosk. For the first time at CES, Kodak is showcasing one of its leading printing solutions for photo specialty printers, professional photo labs and commercial printers. The KODAK NEXPRESS Photo 3300 Digital Production Color Press produces best-in-class images for brilliant-quality photo books, calendars, and posters, even with effects like in-line dimensional print, which is unique in the industry. Photo books created at KODAK Gallery are printed on a KODAK NEXPRESS Press. Three Kodak products earned CES Innovations 2012 Design and Engineering Awards – the KODAK HERO 9.1 All-in-One Printer, KODAK PLAYFULL Waterproof Video Camera and KODAK PLAYSPORT Video Camera Zx5. Kodak has received a total of 27 CES Innovations Awards to date. Eastman Kodak Company (NYSE: EK) today announced the next advancement in Wi-Fi sharing of high quality images with the launch of the KODAK EASYSHARE Wireless Camera M750. The built-in Wi-Fi for the 16 MP Wireless Camera means you no longer need to connect to a computer to share your images. Simply connect to a wireless network and sit back while your pictures are sent to your favorite social media destinations via the Share button. "The launch of the EASYSHARE Wireless Camera M750 marks the perfect union of the smartphone and digital camera," said Phil Scott, Vice President of Digital Capture and Accessories. "The two technologies are now married to bring consumers the best experience from capture to share. Socially savvy users no longer have to compromise on image quality, now we can take great pictures and share instantly." The KODAK EASYSHARE Wireless Camera M750 also comes with a great array of features. Tap, swipe or drag your photos with ease with the bright 3.0 inch Capacitive Touch Screen. Capture pictures in stunning detail from afar, with the powerful RETINAR HD 5x Zoom Lens that keeps every detail crisp and clear. Never miss the action with the dedicated video record button that enables you to shoot in HD video on the fly. Then backup your images and video effortlessly with wireless back up to your home computer. Or copy your pictures to any compatible mobile Wi-Fi device. KODAK EASYSHARE Wireless Camera M750 includes Kodak's Smart Capture which adjusts settings automatically and includes special capture modes and photo effects for taking pictures that express your creativity. KODAK also offers the option of wireless sharing with Eye-Fi Wireless Memory Cards (sold separately) on four other 2012 KODAK EASYSHARE Cameras including the EASYSHARE SPORT C135 , EASYSHARE M215, EASYSHARE M565 and EASYSHARE Z5120. Just press the Share button to wirelessly share pictures or videos. Eastman Kodak Company (NYSE: EK)continues to innovate offering brilliant ways to do more with your pictures. One year ago, Kodak was the first to offer printing from FACEBOOK on a KODAK Picture Kiosk. Today, the number of KODAK Picture Kiosks connected to FACEBOOK continues to climb and over 1 Million unique users will have printed their favorite photos from the KODAK Picture Kiosk through January 2012. In a socially connected world, Kodak is making it easier than ever to enjoy pictures beyond the FACEBOOK wall. The success is attributed to the growing number of images that are being uploaded and enjoyed on FACEBOOK every second of the day along with the ease and simplicity that Kodak brings to creating one-of-a-kind premium photo products from their pictures. Using FACEBOOK Connect on the KODAK Picture Kiosk allows consumers to access their FACEBOOK photos and their friend's photos to create and print brilliant keepsakes. In just minutes, Photo Books, Personal Greetings, calendars, photo cards, collages and prints can be created and made into great gifts in an instant. In addition to the kiosk, Kodak launched the My KODAK MOMENTS App My KODAK Moments on Facebook | Facebook for Holiday 2011. Consumers now have the ability to print directly from FACEBOOK taking all of those images that they enjoy and share daily on FACEBOOK to create a Photo Book or print without leaving the FACEBOOK Site.